A group of three researchers from KEK, Shizuoka University and Osaka University has for the first time revealed the way our universe was born with 3 spatial dimensions from 10-dimensional superstring theory in which spacetime has 9 spatial directions and 1 temporal direction. This result was obtained by numerical simulation on a supercomputer. According to Big Bang cosmology, the universe originated in an explosion from an invisibly tiny point. This theory is strongly supported by observation of the cosmic microwave background and the relative abundance of elements. However, a situation in which the whole universe is a tiny point exceeds the reach of Einstein's general theory of relativity, and for that reason it has not been possible to clarify how the universe actually originated. In superstring theory, which is considered to be the "theory of everything", all the elementary particles are represented as various oscillation modes of very tiny strings. Among those oscillation modes, there is one that corresponds to a particle that mediates gravity, and thus the general theory of relativity can be naturally extended to the scale of elementary particles. Therefore, it is expected that superstring theory allows the investigation of the birth of the universe. However, actual calculation has been intractable because the interaction between strings is strong, so all investigation thus far has been restricted to discussing various models or scenarios. Superstring theory predicts a space with 9 dimensions, which poses the big puzzle of how this can be consistent with the 3-dimensional space that we live in. A group of 3 researchers, Jun Nishimura (associate professor at KEK), Asato Tsuchiya (associate professor at Shizuoka University) and Sang-Woo Kim (project researcher at Osaka University) has succeeded in simulating the birth of the universe, using a supercomputer for calculations based on superstring theory. This showed that the universe had 9 spatial dimensions at the beginning, but only 3 of these underwent expansion at some point in time. This work will be published soon in Physical Review Letters. In this study, the team established a method for calculating large matrices (in the IKKT matrix model), which represent the interactions of strings, and calculated how the 9-dimensional space changes with time. In the figure, the spatial extents in 9 directions are plotted against time. If one goes far enough back in time, space is indeed extended in 9 directions, but then at some point only 3 of those directions start to expand rapidly. This result demonstrates, for the first time, that the 3-dimensional space that we are living in indeed emerges from the 9-dimensional space that superstring theory predicts. This calculation was carried out on the supercomputer Hitachi SR16000 (theoretical performance: 90.3 TFLOPS) at the Yukawa Institute for Theoretical Physics of Kyoto University. It is almost 40 years since superstring theory was proposed as the theory of everything, extending the general theory of relativity to the scale of elementary particles. However, its validity and its usefulness remained unclear due to the difficulty of performing actual calculations. The newly obtained solution to the space-time dimensionality puzzle strongly supports the validity of the theory. Furthermore, the establishment of a new method to analyze superstring theory using computers opens up the possibility of applying this theory to various problems. For instance, it should now be possible to provide a theoretical understanding of the inflation that is believed to have taken place in the early universe, and also the accelerating expansion of the universe, whose discovery earned the Nobel Prize in Physics this year. It is expected that superstring theory will develop further and play an important role in solving such puzzles in particle physics as the existence of the dark matter that is suggested by cosmological observations, and the Higgs particle, which is expected to be discovered by LHC experiments. Primordial weirdness: Did the early universe have 1 dimension? Who cares about the fourth dimension? Could the Higgs boson explain the size of the Universe? IMO this result can be demonstrated in much simpler way in AWT (dense aether theory). We can make particle simulation and find the dimensionality of particle fluctuations, which enable the slowest energy spreading. The same can be made experimentally with passing the sound through condensing supercritical fluid. The whole trick is based on the fact, the density fluctuations of gas are forming n-spheres in hyperspace and the energy density depends on the volume/surface ratio of these hyperspheres. Surprisingly, for 3D hyperspheres this ratio is highest one, the radius of both circle (2D sphere), both 4D hypersphere is smaller with respect to its surface, than at the case of 3D sphere. It's because the transverse waves are spreading through surface of particles forming the volume of environment and the slower their speed is, the larger is the space which they form. It explains too, why the density fluctuations of dense gas converge to packed spheres with increasing density of that gas. The newly obtained solution to the space-time dimensionality puzzle strongly supports the validity of the theory. The same result can be obtained with many different ways. Actually, there are many hyperdimensional theories and for example the Heims theory or with holographic principle predict the same result for entropy flux. http://arxiv.org/abs/1106.4548 In addition, Heim's theory can predict many things, which string theory cannot. Before some time Dr Karch and Dr Randall demonstrated too, that a universe filled with equal numbers of branes and anti-branes will naturally come to be dominated by 3-branes and 7-branes because these are the least likely to run into their anti-brane counterparts and thus be annihilated. To the editor: "the universe originated in an explosion from an invisibly tiny point." Can we stop making such false statements about the big bang please ? It's about as absurd as saying it was purple. well they got one scenario 10^500 - 1 to go. This is why I don't really think, the above result was obtained with fully fledged string theory, but rather with some formalism of it, which neglects some of inconsistent postulates, which would normally lead into fuzzy solution. It's about as absurd as saying it was purple. Big bang model is absurd by itself - it doesn't matter if you call it purple or invisibly tiny. that actually EXACTLY what all the major BB theorists continue to say publicly, to this day. I was just watching a brand new documentary on Nat Geo 2 days ago, and they used that same language again. Apparently, solving superstring theories has not been high on the supercomputer list of things to do. Seeing as so far it is kind of a waste of time until we can pull string theory into the empirical realm, I understand why they were hesitant to waste good supercomputing time on this. However, actual calculation has been intractable because the interaction between strings is strong, so all investigation thus far has been restricted to discussing various models or scenarios. But I digress, I suppose string theory is interesting enough that we should throw a few resources at it. Hopefully someday it will even make predictions. Until then, third tier "super" computers are good enough. Ya mean we can have our hyperspace travel and anti-gravity generators somehow. How about deflector shields and inertial dampeners too. Even the replicator becomes possible. All it takes is a LOT of energy and the means to handle and transfer it. Einstein is becoming a subset and a LOT of jobs are in danger when this is recognized by some forward looking country that breaks convention in order to gain a military advantage. BTW, does anything in string theory make sense of why the original 10 dimensions were there to become our 3 1 universe or why there is only one time dimension--both before and after the expansion? You are both correct and make valid points. However, we people that understand these things are not really the intended audience of these shows. They dumb it down to attract NEW laypersons, usually children that understand what explosions are, but not "inflation," and who will eventually figure this out if they really care. All I'm saying is, I understand why the writers do this. I might not if I were in their shoes, but I understand. I do similar things when explaining technical IT/networking issues to my customers. Not all viewers are aspiring physicists. does anything in string theory make sense of why the original 10 dimensions were there to become our 3 1 universe or why there is only one time dimension--both before and after the expansion? It has meaning from dense aether model perceptive, the perspective of dense particle packing geometry in particular. If you compress the mutually repulsive particles, these particles will form clusters. If you compress them even more, these clusters will form another clusters, and so on. But there is the trick - the clusters in one generation have only limited interactions with the clusters in another levels, actually the more, the more these levels are separated. The number of these levels is surprisingly low and only three levels of particle clusters can exchange energy directly in transverse waves. Because the 3D clusters are preferred, as I explained above, it leads to the number of nine dimensions plus one or two time dimension(s). This behavior can be modeled with nested fluctuations of supercritical fluids or plasma crystals in lab, but as usually, we can use real life hyperdimensional analogy to demonstrate it too. The normal companies use up to three levels of hiearchy, higher number levels is ineffective and it's better to split such a company. Even the communal control of government has only three levels only from good reason - it's virtually impossible to control people when the higher number of levels is considered. The internet protocols and API layers in SW applications are usually using up three levels too - above this number they're becoming HW and SW independent. You would probably find many other examples of the apparent causual limit of hyperdimensional geometry. Of course, the above is valid only under the assumption of Euclidean geometry, but the geometry formed with hypersphere packing in nonEuclidean and the number of dimensions is apparently higher there (about 245 dimensions or so). Create a program that doesn't give you the results it was designed to give and you are a poor programmer. Because the character of mutual interactions of fluctuations depends very slightly from the nature (formal model) of fluctuations in remote levels of nested hierarchy, we could probably get the very same result simply with numerical solving most common wave equation in sufficient number of dimension. It's because the projection of any object from higher dimensions into low number of dimensions is the more similar to pin-point particle, the higher dimensional the projection is. After all, this is why the dense particle model of reality provides the same qualitative result, like much more complex models of string theorists. In sufficiently high number of dimension it doesn't matter, if you model the Universe with particles of gas and/or quantum wave packets and/or gummy bears - the result is independent on the geometry of underlying particles. It means, the nature of string theory has nearly nothing to do with the actual result, the holographic models works here as well, as I linked. The whole trick is based on the fact, the density fluctuations of gas are forming n-spheres in hyperspace and the energy density depends on the volume/surface ratio of these hyperspheres. Surprisingly, for 3D hyperspheres this ratio is highest one, the radius of both circle (2D sphere), both 4D hypersphere is smaller with respect to its surface, than at the case of 3D sphere. Completely and utterly false. Surfaces get more massive as the number of dimensions gets larger, and n-spheres are no exception. The surface to volume ratio of hyperspheres is in particular n/R, where n is the number of dimensions and R is the radius, and it is obvious that the ratio becomes larger as you pass to higher-dimensional embedding spaces. I'm curious: do you just invent facts for fun, or do you actually believe the garbage that you constantly seem to post? Wake me up when string theory predicts something new and verifiable. The surface to volume ratio of hyperspheres is in particular n/R, where n is the number of dimensions and R is the radius, and it is obvious that the ratio becomes larger as you pass to higher-dimensional embedding spaces. For the unit hypersphere, the hyper-surface area reaches a maximum and then decreases towards 0 as number of dimensions increases. I wonder if those other dimensions have other dimensions within them, in such a way that they would be like the TARDIS of Doctor Who.. small on the outside but bigger on the inside. Wouldn't you need at least two temporal dimensions? How can you have time moving in one direction and decoupled from the other? If you did have 1 temporal dimension, wouldn't you need to have another else you would fall into that information paradox? No, it isn't. EXPANSION OF SPACE TIME, not EXPLOSION IN SPACE. The title of the article appears to be a pile of hyperbole! Nothing was "proven". Furthermore, without knowing the code for the supercomputers I am suspicious of programming a curve fit to the theory. Callippo = rawa1, pick one name and stick with it. Geesh. Stick to answering comments, not people - and you'll get the matter of fact discussion without subjective personalities. Indeed and the number of dimensions of string theory is not any exception. They're are many of them. "..This goes back to the pre-arXiv days, before many of our current graduate students were even born, but some of us are old enough to remember similar claims being made back in the late 1980s. For example theres the 1989 Brandenberger-Vafa paper claiming that string theory predicts 3 dimensions, using a string gas cosmology. I dont remember if there was a finally, physicists find a way to make a prediction based on string theory press release back in 1989 or not..."
I understand every dimension including time stretches in opposite directions. Forward time for matter, backwards for antimatter (per Feynman/Dirac). So originally the energy density of the universe was very high. For the guys who claim the total energy of the universe is zero, maybe all this initial energy is balanced out by what might be the negative energy of compacted spacetime. Seems strange though. So originally the energy density of the universe was very high. There was no "origin". At the water surface all ripples collapse at distance. Does it mean, the water surface is more dense there? Ok at the beginning of the expansion cycle. All energy, no matter, no water, too hot. Which expansion do you mean? In AWT the matter and energy ratio is always balanced at 1:1 value at the sufficient distance. I mean the expansion phase that we are in right now. The ancient science of Kabbalah speculated that there were 9 dimensions encompassing true reality plus our physical realm of time, space and motion being the tenth. Moreover, Kabbalah defined time as the distance between cause and effect. Time exists for one reason: to separate cause from effect thereby imbuing humanity with free will, including the free will to disbelief everything Kabbalah teaches. By separating cause from effect, good deeds seem to go unrewarded and negative selfish actions driven by ego seem to go unpunished creating the illusion of chaos. But the fact is, the effects always appear at some point in our future but this sudden appearance feels like random chaos. When Einstein received his inspiration for his theories of relativity or Mozart heard a one hour symphony in his mind in a flash, they were making contact with these other dimensions which are realms of pure consciousness, infinite, endless and luminous. I'm impressed with number of people, who are downvoted my above posts (thermodynamics, MiniMonsterGroup, ShotmanMaslo, MorituriMax, gwrede, verkle, Thrasymachus, Raygunner, flicktheswitch, MarkyMark, Deesky, Blakut, Ojorf, jibbles, Eoprime, George_Rodart, bewertow, jsdarkdestruction, Osiris1, Eglerion, orac, vega12, 350, MonkeyHill, ...). No one from regular posters, though. And no objection. The people just don't want to hear about particle packing geometry. This is simply funny. How else do you want to understand the string theory and extradimensions concept? Very perceptive. However I don't think without time there would be any effect. @Seeker2, without time, cause and effect are one. Actually no time, no cause, and no effect. No worry. Once again, a lot of Brownian buzz. And, it seems, the discussions here, mirror the subject matter - multilayered, multi-dimensional, rather chaotic in nature and, at the end of the day, without any single observable truths (save for the expounders belief in their own POV). Does this make the whole experience fractal or ergodic? And why does the header say 10 dimensions and the article only says 9? Are they saying that our 3 spatial dimensions count as the 10th? Just try to read the header carefully. " 10-dimensional superstring theory in which spacetime has 9 spatial directions and 1 temporal direction" The number of spatial dimensions is odd for IIA string theory type and even in ST type IIB (which was used in the above simulation), the time dimension is separate dimension. Calippo and Rawa1 are the same person? Yes, but the persons aren't relevant in matter of fact discussion. Only dull people need to recognize ideas by their authors, not by their meaning. I am curious how something can come from nothing as the string theorists proclaim. Maybe you could provide some entertainment in explaining that to us laypersons? Also explain how the entire universe was at one time compressed into a tiny speck. It should be very easy for you to add to that illustation what existed prior to the BB, what caused the BB and how the nine spatial dimensions, plus the one temporal dimension were created. The Wikipedia illustration is very concise and needs to be extended. I almost forgot. Please include the matrices in the single line diagram. I am not sure if this is the same simulation I was reading about a week? ago, but I believe they made some "shortcuts" so that it could be effectively computed in their supercomputer... AKA it isn't a full simulation because it would probably take forever to run that even on the fastest supercomputer. Just by way of prefacing my comment, I'm not promoting any alternative theories in physics. So. I'm struggling with the notion that this matrix computation yields "strong proof" of anything. What they did amounts to a ginormous simulation. Ginormous to us, surely, but not as ginormous as the real thing: the universe, and every particle, wave, or whatever-it-is in it, over around 14 billion years, give or take. They had to take some shortcuts to simulate all of that on a single supercomputer over a manageable, human-scale period of time. And there, my friends, is the rub. The design of the simulation, not the physical universe, determined the outcome. Simulations are interesting, certainly, but until we see string theory generate hypotheses testable through experimentation, there's no "strong proof." but until we see string theory generate hypotheses testable through experimentation, there's no "strong proof." Inside of dense particle systems common in condensed phase physics (superconductors, quark-gluon condensate superfluid) various indicia exists for multidimensional geometry, the five-dimensional AdS/CFT correspondence in particular. These indicia aren't conclusive for string theory as such, as the AdS/CFT correspondence has been used in context of other theories too. You cannot expect strong evidence of string theory, because it leads into many (more than 10E 520) solutions by its very definition. But these results are indicating, at least the multidimensional approach to description of dense particle systems is correct. Within the human brain is the existance of e=mc2: all e and m is inside that brain. E=mc2 is not aware of that envelope that contains it. Outside that envelope, two times beyond, is where the Source exist. Seek and you will fine it. 1=1. Our atomic Universe is but one of a sequence of otheres that existed before it: Taylone 12/2011. It's true, in it's present form string theory lacks the testable predictions, but both the string concept, both the concept of extradimensions has a good meaning even in context of dense aether model (density fluctuation of dense gases like the supercritical fluids have well pronounced stringy appearance). The question, whether these postulates can be reconciled with another postulates of string theory (like the Lorentz symmetry) in reliable way is another thing. Although it may not be quite apparent for laymans, the approach of string theory to reconciliation of quantum mechanics with special relativity is quite straightforward - it's actually way simpler, than it should/could be. But even the very simple approaches lead into complex math at the case of relativity and quantum mechanics, because these two theories are complex by itself. And guess what, i even report your AWT posts because of pseudoscience (like NeutronRepulsion). now please get lost and take Omatrumbum withyou. The arrogance and aggressiveness of mainstream science proponents increases proportionally with their feeling of threat. In this case it's not fear from refusal of their theories, but the fear, someone could explain them in more transparent way, then they're using itself. Because mainstream physicists are playing role of priests of contemporary society, or like shamans guarding their empirical secrets. From the same reason the Holy Church was so upset, when someone tried to explain God in natural way - it was more dangerous for it, than the simple negativism. There is nothing non-physical on dense aether model with compare to string theory. It's very simple and natural model of reality and all main aspects of which can be modelled with common water surface. With compare to string theory and various ad-hoced theories. As you can see above, the dense aether model enables even to explain the strengths and weakness of these theories. No concept is nonsense, until you prove the opposite. I'd say material is a particular configuration of spacetime. And include all forms of energy and fields. Good points on time. Without time no expansion of space. Time passes at the exact rate that space expands. That would have been pretty fast at the the beginning of expansion. Because mainstream physicists are playing role of priests of contemporary society, or like shamans guarding their empirical secrets. From the same reason the Holy Church was so upset, when someone tried to explain God in natural way - it was more dangerous for it, than the simple negativism. So your fear of mainstream physicists is basically the same as that of the Holy Church. all main aspects of which can be modelled with common water surface. So basically AWT is a Genesis 1 update. Not fear, but AWT description of that community. Every community of people would behave in the same way, being at their place. It rather explains, what the Big Bang theory and Genesis have in common - at both sociopsychological, both factual perspective. Not fear, but AWT description of that community. Must not be too much. I thought you were a steady state man. The sectarian community doesn't differ conceptually from dense stars filled with boson condensate. From outside they're rigid but brittle and censor the informational flux like event horizon of black holes. Inside the informational propaganda is spreading without resistance like energy inside of superfluids. The new ideas penetrate into inside like the bubbles through surface of fluid and they're repelled with it. On the other hand, the ideas compatible with the rest are adopted uncritically. The more fundamental idea is, the more obstinately is ignored and denied like the droplets with high curvature of surface. I thought you were a steady state man. AWT just says, from sufficiently distant perspective the steady state and big bang models will become indistinguishable each other. The uniform distribution of redshift indicates, it's of anthropocentric origin but this uniformity is violated with Doppler anisotropy of the red shift. Note that the Doppler anisotropy of the red shift doesn't fit well both Big Bang model, both Steady state model (in which the Universe should be homogeneous). AWT explains the Hubble red shift with Stokes dispersion of light with inhomogeneous vacuum fluctuations in similar way, like the dispersion of ripples at the water surface - but there is no reason for completely flat water surface. It's just a model, i.e. the simplification of the real situation. IMO the concept of ideas or memes which are spreading through society like the packets of informations could model the difference between photons and neutrinos. The photons are behaving like "politically correct" ideas conform with society, whereas the neutrinos are spreading like "crackpot ideas", stuffed with "nonsense" and "random noise". A typical conform theory is the idea of hot fusion, Higgs boson or gravitational waves, the idea of cold fusion is typical crackpot theory. Note that even crackpot theories are spreading coherently: even the "cold fusion" or "pyramid energy" hypothesis have their own subculture, promoters and set of experimental confirmations. They're just ignored with mainstream, because they have no coherent theory behind it. As the result, nobody of mainstream society wants to "waste time" with such an ideas, they tend to propagate faster than regular speed of information. Whereas the "correct ideas" exhibit synergy, which leads the people to deal with them. The people, who are collecting, exchanging and spreading "politically correct" and "politically incorrect" ideas are behaving like particles of matter and antimatter inside of society. Now we can observe, the proponents of "politically correct ideas" tend to organize into "massive bodies", whereas the crackpots are remain finely dispersed because of incoherent nature of their ideas and their motivations. Both groups indeed hate each other and annihilate wildly at proximity in discussions, which lead nowhere. But we can observe certain long distance forces here, when every large group of people (or significant proponents) from one camp attracts the people with opposite opinion like the clouds of dark matter (finely dispersed particles of antimatter) are surrounding massive particles of heavy objects. For example Einstein (as a famous proponent of mainstream science) was regularly flooded with letters from many crackpots, who tried to explain him, why and how the relativity is wrong. Note that despite our society is materialistic, the above model is essentially symmetric, as it does care just about quantity symmetry. Before some time the scientists were considered an incoherent crackpots spreading blurbs, and the Holy Church maintained its religious, nevertheless coherent theology. Before some time our society passed through Big Bang, during which the social roles of both materialistic both religious groups exchanged. Now it's the mainstream science, the physics in particular which becomes incoherent with its dual set of rigid theories and many "crackpots" are considering it as crackpotish, as they're considered with proponents of mainstream physics. And the whole transform will repeat at the more general and richer level again. Note that this phase transform is of gradualist nature, it proceeds in isolated islands ("galaxies") at different stages and we can find the residua of previous phase all around us - actually in the similar way, like the Big Bang residua. The sectarian community doesn't differ conceptually from dense stars filled with boson condensate. So AWT theory would seem to be much more effective describing the sectarian community than any possible physical application. AWT just says, from sufficiently distant perspective the steady state and big bang models will become indistinguishable each other. Total ignorance should be a sufficiently distant perspective. Human society is complex hyperdimensional system. Existing physical models are restricted to three-four dimensions. The fuziness of AWT is advantage for description of fuzzy relationships inside of human society, where most of quantities are difficult to quantify, if not measure. For example, in physics the speed of light is well defined, but which is the speed of information spreading inside of human society. But it still provides analogies, which could simply the understanding of physical systems (like the difference between photons and neutrinos, above described). Every complex hyperdimensional system appears like chaotic particle system from low-dimensional perspective. As Asimov one noted, every sufficiently advanced technology (theory) is indistinguishable from miracle (religion). 9 dimensions is not the same as 9 directions. A dimension has 2 directions, thus 9 dimensions equals 18 directions. In physics dimension means number of motion freedom degree, i.e. the number of directions, in which the energy can propagate in independent way. 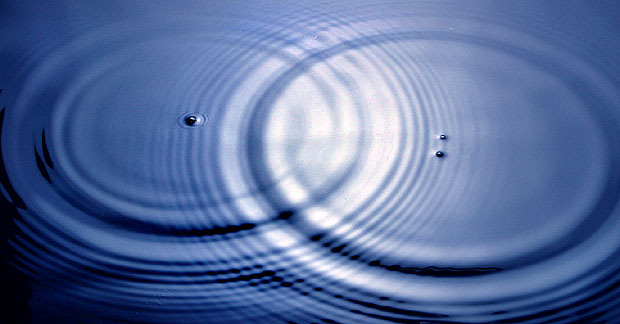 For example, the water surface is two-dimensional, because the energy of surface ripples can propagate in two independent directions without influencing the ripples in another directions. The fuziness of AWT is advantage for description of fuzzy relationships inside of human society, where most of quantities are difficult to quantify, if not measure. Right. Keep it fuzzy so it can't be tested. That way nobody can prove it's wrong. Right. Advanced technology is basically black magic. The time dimension is generally considered unidirectional, but in dense aether model has always two directions, because every density gradient of entropy is actually represented with pair of dual space-time gradients. Whereas the short-wavelength photons and heavier particles travel across density gradient of gravity field, the longwavelength photons and neutrinos are traveling in the opposite direction. In this way the subtle portion of observable matter always travels against time arrow defined with entropy flux. Bellow human observer scale most of massive objects tend to evaporate, above this scale they collapse with gravity. In physics dimension means number of motion freedom degree, i.e. the number of directions, in which the energy can propagate in independent way. So up and down would be 2 directions so 2 dimensions? Being fuzzy doesn't means being untestable - on the contrary, in many cases the qualitative predictions are much more robust. Especially under the situation, when another theories predict some deviations too, so they cannot be distinguished easily. But when theory predict, some object will switch its behaviour under certain conditions, then such a prediction can be falsified in much easier and more reliable way. On the contrary, the fact, string theory can predict 10E 520 solutions EXACTLY doesn't mean very much from perspective of falsifiable predictions, because it's just a random noise. From Occam's razor perspective it's always better to give fuzzy but unique prediction rather than many exact, but mutually colliding predictions. Which is one of reasons, why physicists are trying to reconcile the general relativity and quantum mechanics, after all. It depends on the context. In noncommutative (nonabelian) group theories these directions are never equivalent (they introduce Berry phase during their reversal in accordance to the proverb "you never cross the same river twice"). Which means, they're handled as a separate dimensions (some versions of string theory handle two dimensional time in such a way). In AWT all dimensions are noncommutative: if you travel to same place, you'll always appear at somewhat different universe, then during travel in the opposite direction: no action is completely reversible here. I wouldn't want a fuzzy prediction no matter how unique it was. In noncommutative (nonabelian) group theories these directions are never equivalent (they introduce Berry phase during their reversal in accordance to the proverb "you never cross the same river twice"). Which means, they're handled as a separate dimensions (some versions of string theory handle two dimensional time in such a way). In AWT all dimensions are noncommutative: if you travel to same place, you'll always appear at somewhat different universe, then during travel in the opposite direction: no action is completely reversible here. Sort of like the aging process. I understand. Inside of random universe the reality simply becomes fuzzy at the sufficiently global/general scale. We are limited portion of much bigger reality, so we cannot see it all in detailed way. It doesn't mean, no quantitative predictions doesn't exist there at all, but in general you cannot have universal and exact predictions at the same moment. It's generalized form of uncertainty principle of QM. in general you cannot have universal and exact predictions at the same moment. It's generalized form of uncertainty principle of QM. True. You can generalize the uncertainty principle until you get total nonsense if that's what you want. Opportunities unlimited. You can also be so critical as to just be a non contributing side stepping the point spam, which is an indication of your ability! all this talk bout string theory... It is my understanding at this date that they are vibrating. Does anybody know if they are all vibrating at a different frequency? If not, how many different frequencies (flavours) are there? And at what freq are they vibrating? Well, Ed, as in indication of my ability, I would say strings vibrate at many frequencies, probably depending on the temperature. The cut-off frequency is probably somewhere around the gamma ray frequencies. When the temperature drops the vibrations slow down. When the vibrations stop the music is over. I think the temperature now is less than 3 degrees Kelvin and still dropping as space expands and cools off. When the music stops the strings collapse. Someone will have to re-tune and pluck those strings again if they are going to re-start the music.